Brisbane city’s waterfront is undergoing a significant transformation with the help of local Indigenous groups. Turrbul and Jagera indigenous groups have worked with Destination Brisbane Consortium to develop interpretive designs of animal totems that are important to the local Indigenous community, such as the echidna and snake, for the first public space to open this year as part of Queen’s Wharf Brisbane. Since mid-2018, contractors have been upgrading a 500-metre section of waterfront, spanning from the Goodwill Bridge to the area behind 1 William St, to create a new segregated bikeway, recreational park and a pedestrian riverwalk – named the ‘Mangrove Walk’. 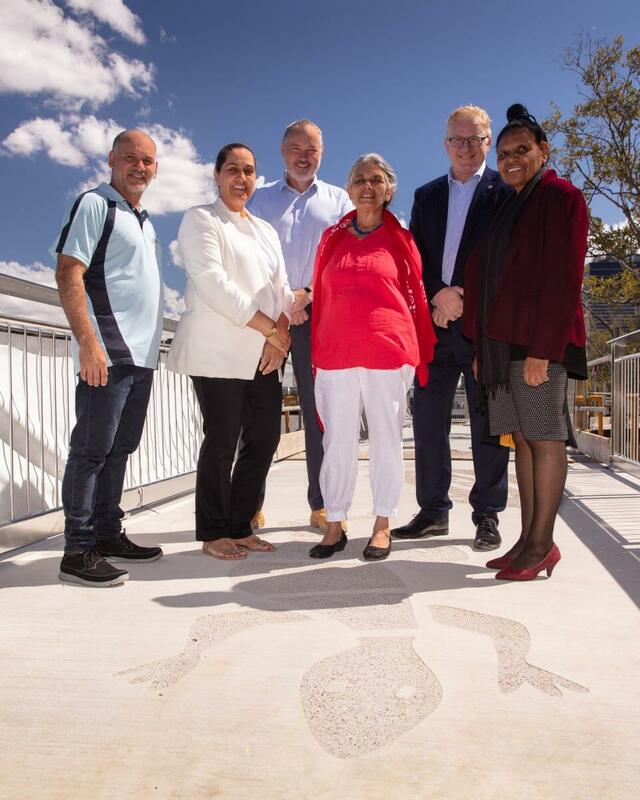 Destination Brisbane Consortium Project Director Simon Crooks said it has been an honour to work with the local Indigenous community to enable Queen’s Wharf to showcase Indigenous designs and storytelling as part of the 450-metre Mangrove Walk. “The Turrbal and Jagera people have been generous enough to share some of their heritage and culture with us for the enjoyment of the additional 1.39 million visitors expected to walk through Queen’s Wharf each year,” Mr Crooks said. “We have been working with the Indigenous community since before construction began to establish Cultural Heritage Management Plans and create these wonderful designs that will be admired by millions of visitors for many years to come. “The interpretive designs represent totems that are relevant to the Indigenous people of South East Queensland and include a mullet, snake, echidna, emu, water hen, kangaroo, lizard and black swan. “Working with our contractor Multiplex, the designs were carefully adapted and then sandblasted onto the concrete walkway that makes up a critical connecting point on the Mangrove Walk, either side of the QUT CityCat terminal walkway. “The method of sandblasting and applying these totems to the walkway will ensure they endure the test of time. The pedestrian only Mangrove Walk and Boathouse Pavilion along with Waterline Park, a new recreational park under the Riverside Expressway behind 1 William St, is set to open to the public towards the end of the year. The 500 metres of upgraded bikeway is set to open late-August 2019. Star Entertainment Group alongside its Hong Kong-based partners, Chow Tai Fook Enterprises and Far East Consortium. With the diverse range of premium dining, shopping, entertainment, and accommodation options on the way, we expect Queen’s Wharf Brisbane to generate an extra 1.39 million visitors per year to the state, and in turn, deliver a further $1.69 billion annual increase in Queensland tourism spend. • In Aboriginal society, everyone is allocated a Totem. • People don’t ‘own’ their Totems, rather they are accountable for them. • Each person has a responsibility to ensure that their Totems are protected and passed on to the next generation. • The Totem is a spiritual emblem of a natural object, plant or animal that is inherited and defines peoples’ roles, responsibilities and relationships with each other. Consequently, people are considered as part of nature and are morally obligated to treat animals, plants and landforms with respect.